Born in 1999, Moscow. Pupil of the Central Music School at Moscow Tchaikovsky State Conservatory (class of Maxim Zheleznov). 2015 - Grand Prix winner at the International Piano Competition in Villahermosa (Mexico). 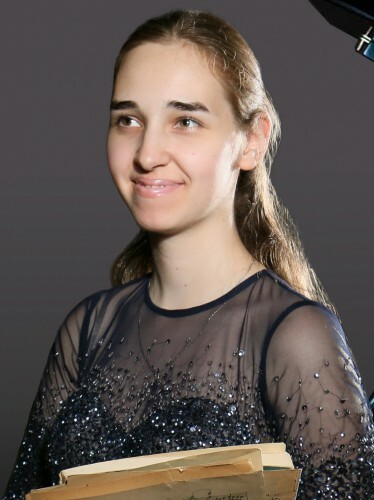 2015 – laureate of the II Prize and silver medalist at the Tchaikovsky International Youth Competition (Novosibirsk). 2016 – winner at the 50th International Competition "Concertino Praga" (Prague). 2016 – laureate of the II Prize at the International Youth Competition Arthur Rubinstein (Beijing). 2016 – winner of the special prize for best performance of A. Ginastera piece at the V International Piano Competition BNDES (Rio de Janeiro, Brasil). 2017 – winner of the Eurasian Music Games (Astana, Kazakhstan). 2018 – winner of the XII International F. Chopin Competition (Narva), winner of International Piano Competition of Lyon. She holds the Scholarship from Vladimir Spivakov Charity Foundation and YAMAHA Charity Foundation. She took part in Denis Matsuev Festival "Stars on Baikal". Member of the St. Petersburg Music House programs since 2016.